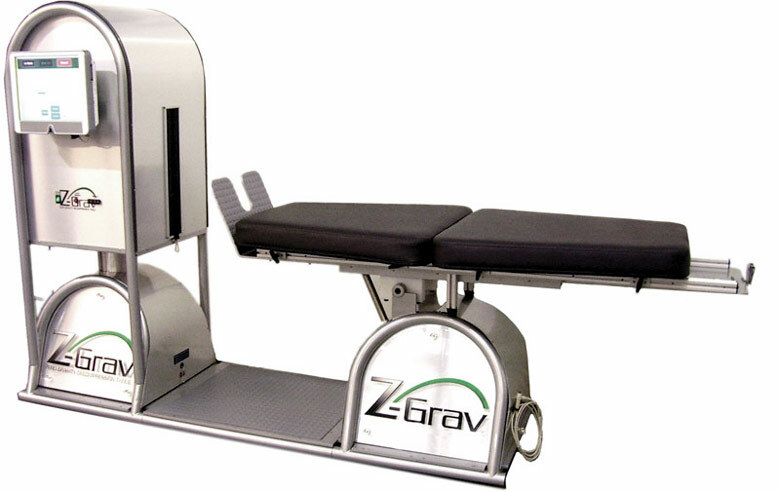 The Z-Grav decompression table was developed by Carlos Bacerrios, a world-renowned medical researcher and one of the first people to discover spinal decompression. Its variety of decompression programs and adjustable variables allow for treatment of pain related to chronic and severe conditions such as disc herniations, disc bulge, degenerative disc disease, facet arthrosis, sciatica, and stenosis. Decompression is thought to relieve pressure that builds up on the discs and nerves. This procedure may help relieve pain by helping to move areas of the herniated disc away from nerves. It also may provide relief for conditions such as stenosis, sciatica, facet syndrome, arthritis. By creating negative pressure within the disc, also called nagative intra-discal pressure, the Spinal Decompression procedure is thought to draw the bulging or herniated disc back into place while relieving pressure. Ligaments that hold disc material in place can become torn or stretched as a result of herniation or bulging, but rehab modalities help to strengthen those ligament bands, allowing them to prevent future recurrance and help to hold the disc material in place properly. In most cases this process requires only a few weeks of treatment on an out-patient basis. CALL TODAY... for more information &/or schedule an appointment for consultation.